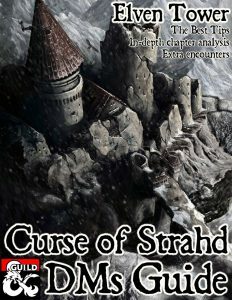 The main Curse of Strahd module encompasses levels 3-10. If you already have level 3 players you can jump right into the action of Barovia’s encounters. However if you wish to start from level 1, the attached dungeon crawl Death House is a great tool to level the party up, set the tone of the campaign and introduce a few clues and facts about the realm. After using one of the adventure hooks (page 18), you have successfully steered the party to Barovia. The mists will dictate the places the party can visit. They will close up on them leading them to the Village of Barovia. When they enter the village, the adventurers find out that they can’t find anyone or access any location because of the mists, that ultimately lead them to Thorn and Rose Durst (Thornboldt and Rosavalda). I advice to treat these children like a simulacrum-like spell. Yes they are still illusions but appear too be real children and won’t vanish. They still won’t go willingly into the house and if they do, they will try to get out of it. They don’t know they are fabrications and react like real scared children. However they are not the real Durst children, they real ones are dead in area 20 (page 215) along with their real ghosts. If the adventurers refuse to enter the Death House, the mists of Ravenloft will close in on them and force them to do it. They will have no other choice (Hop on the railroad car). The way this adventure works. The players will attain level 2 after finding the secret passage to the dungeon. And then level 3 after escaping the house. Depending on your group, and how roleplay heavy they are. All this can be achieved in 6-10 hours of playing. Which makes for a really fast way to level up from level 1 to 3. There are 38 locations in the Death House. Not all of them need to be visited, your group might skip some parts of the house or the dungeon. It’s important to note that after exiting this place, it’s unlikely that the adventurers will visit it ever again. This is a list of important bits of information, important locations and specific advice to run the different locations in the Death House. 3. Den of Wolves.- There are two cabinets that can be lock picked, one of them contains a heavy crossbow, a light crossbow and 20 bolts. 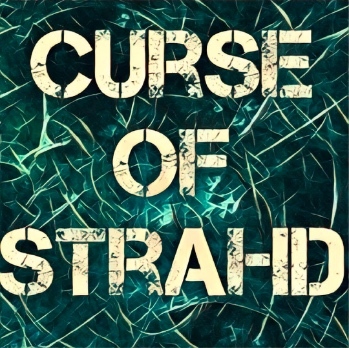 (by the way, god practice for the Curse of Strahd module is to keep track of ammunition). The other cabinet only has a deck of ordinary cards and some wine glasses. 4. Kitchen and Pantry.- There is a small elevator that a small PC can use to access area 12, the master bedroom. 6.Upper Hall.- There’s a portrait of the Durst family. PCs will recognize the children. There’s a third baby in the picture in the father’s arms, Mrs. Durst looks at the baby with scorn. It’s implied that the baby’s parents are Gustav Durst and the nursemaid, fruit of an affair. 9. Secret Room.- There’s a letter by Strahd here. Also PCs will find the house’s deed and a deed to the mill near Vallaki. Also there’s a will bequeathing these properties to the Durst children. 11. Balcony.- The animated armor can be challenging if PCs don’t react properly. Be careful. 12. Master Suite.- There’s a jewelry box with jewels worth 900 gp. A sizable treasure for a level 1 party. And they won’t find something quite like that anytime soon. 15-18. Nursemaid’s Suite and Storage Room.- The nursemaid’s specter can be found in either of these locations. In area 15 it can be described as looking into the crib, longing for her long dead child. Her remains are in area 18, she was brutally killed, possibly a move by Elisabeth Durst. 20. Children’s Room .- The remains of Rose and Thorn are here. They starved to death after their parents locked them in their room. Their ghosts are here. Two ghosts can easily kill a level 1 party, however they are not aggressive and even if a fight starts, the two children are more likely to flee than to attack. Plus they do not have the Horrifying Visage ability. This is not a fight encounter. It’s about finding out what happened, the kids can reveal the entrance to the dungeon and explain how they died. If/when the PCs try to leave, the children will try to possess them, not out of aggression but out of fear of abandonment. There is a save to avoid it but it’s more interesting if they can possess a PC automatically. The book says that players retain control but have to take a temporal flaw and role play accordingly (page 217). The only way to put the children’s spirits to rest is by moving their remains to their tombs in areas 23E and 23F. You can have Rosavalda point that out, that they want to be where their parents are. 25. Well and Cultist Quarters.- In these rooms there’s some treasure to be found. The most important is the silvered shortsword in 25E (page 218). Very useful against some Barovian creatures. 29. Ghoulish Encounter.- Depending on the party’s reaction to this, it can be a very lethal encounter. The PCs have the hallways’ width to their favor, as it’s a natural funnel. A way to warn the party is the smell. You can let them know something is coming with smell and sounds. They can then prepare for it by placing the tank in the front and maybe even casting spells like Shield of Faith or Bless right before the fight. 31. Darklord’s Shrine.- Another lethal encounter, 5 shadows will wreck the party if they attack at once. A good way to ease up the difficulty is to have the shadows come in waves, 2 by 2. 34. Cult Leaders’ Quarters.- Gustav and Elisabeth Durst are here, they are ghasts. This is a difficult fight too. PCs can find a Cloak of Protection as treasure, plus a spellbook. 38. Ritual Chambers.- Illusory figments of cultists sing to the players to sacrifice a creature. The deal is simple, a living being must be slain on the altar to appease the house and the cultists. Results will vary depending on your group’s disposition and alignment. In reality it doesn’t matter what or who dies on the altar. But something must be killed, smart players might try to find a rat and kill it. According to the book that works, but you might rule otherwise. Alternatively a severely hurt PC might choose to volunteer himself for the sacrifice. Or an evil PC could finish off a severely hurt ally. If the PCs comply and a living being is killed off on the altar, the house is appeased and they will be able to leave peacefully and level up. Most likely there will be no sacrifice, which will anger the illusory cultists. They will sing to wake up Lorghoth the Decayer, a Shambling Mound hiding in the southernmost alcove. This is better because you never say the monster name, avoiding metagame knowledge. You are also setting the scene for a probably unwinnable fight. It is designed like this. A level 2 party which has had no long rests and several tough fights will not win this fight without losing some PCs. Your group might choose to fight it and risk death. The usual response to this encounter is retreat. Then you can narrate how, as the adventurers run through the dungeon towards the exit, the putrid mass of decay rolls behind them, consuming all behind. As adventurers reach the top of the attic, they will find themselves in an aggressive place, they house is trying to kill them (page 220). It is a very fun encounter against an enemy who cannot be beaten. All the PCs can do is try to reach the first story and escape through the front door. Or jump from a balcony. After exiting the house, the mists of Ravenloft recede and will let them explore the Village of Barovia. You can start with Mad Mary’s encounter (page 44). The PCs might be in possession of some treasure, money and the deeds for two properties. Strahd is aware of these events. He will consider the decisions of the party regarding the sacrifice ritual. Either way Count Strahd is satisfied, since playing with good or evil aligned subjects is entertaining for him all the same.